Betty Crocker and Rosie the Riveter held their own as fictional female super heroines of WWII. 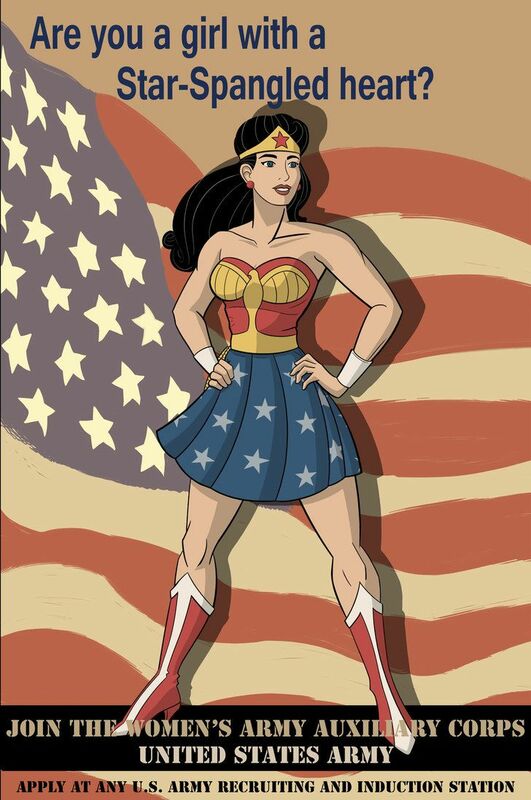 But, let’s not forget Wonder Woman who made her debut in 1941. Prior to television, media entertainment consisted of radio shows, newspapers, and comic books. The latter being sold at a rate of 15 million a month. Rationed supplies of paper and war production make it difficult to document how comic book sales held during the war, but it is no accident that their continued popularity led to the introduction of a women super hero who fought war with love instead of violence. 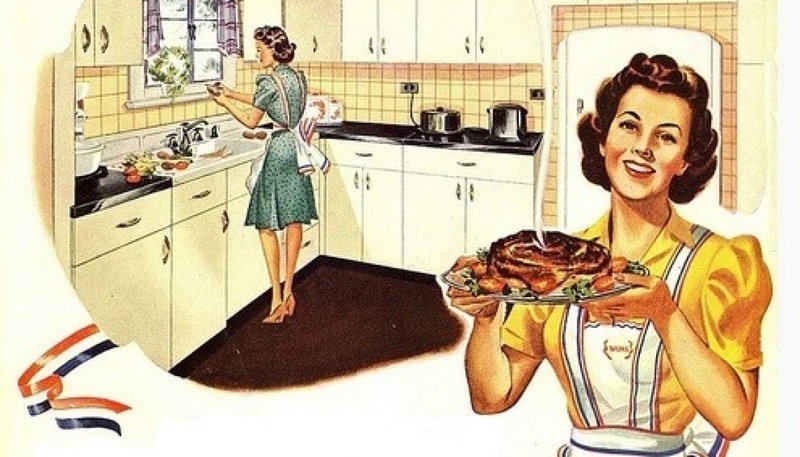 Created in a time when women were increasingly asked to take on some male roles — factory work, wearing pants, holding down the home front, etc. William Marston, the creator of Wonder Woman, based a character on his own wife, Elizabeth, who was ahead of her time in regards to what was socially acceptable for women. While women were not encouraged to earn a degree, Elizabeth held three. She was an attorney and a Harvard-graduated psychologist. Elizabeth was on the front lines of women’s liberation, specifically on voting equality and reproduction rights. Her husband’s motivation behind creating the comic heroine in 1941 was to influence the public into accepting a new independent woman. 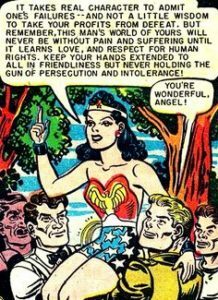 Wonder Woman was incredibly capable, yet beautiful, kind and still feminine. Wonder Woman was quickly met with resistance, dressed in her short skirt and a revealing top that had no straps. She was deemed, “insufficiently dressed”. It took roughly a year for the creator of Wonder Woman to come forward. The public outcry of indecency was met with the identity of an internationally famous psychologist (William and Elizabeth had met at Harvard pursuing their psychology degrees). And it was good that Wonder Woman’s creator was a psychologist as the skeptical crowd needed to hear that such a heroine was not a bad thing. As her acceptance and popularity grew, so did the team responsible for making Diana Prince…err, Wonder Woman, who she is today. Dr. Marston died in 1947, but Wonder Woman and her fight for peace continued under the creative mind of Joyce Hummel who was only 18 years old in 1944 when she was hired to write the comic strip. Even though Wonder Woman was created before the US entered WWII, influences from the conflict and Hummel’s young age during the war play a huge role on the core values of Wonder Woman’s story. The original outfit was American patriotic, of course – blue with white stars, red top. Pin-up poses are reminiscent of nose art on a bomber. Oh…one more thing, Wonder Woman’s lasso of truth? It turns out Dr. Marston is the original inventor of the lie detector. Photos of the prototype device show test subjects wrapped in wires that measure pulse and blood pressure. Wires…closely resembling a truth lasso of sorts.